Sufi Enneagram is a sacred tool used for self-discovery and probing deep into esoteric psychology. Some scholars call it the Signs of the Presence of God. 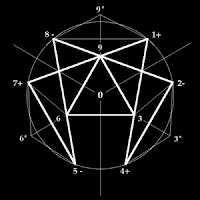 Gurdjieff is said to have introduced the Enneagram to the West, having learnt about it in the context of Islamic esoterism and the Sufi tradition. The word “Enneagram” is derived from the Greek words, “ennea” meaning “nine” and “gramma” meaning “sign”. The main problem facing esoteric iconography experts is the complete absence of books or written materials concerning the subject. In reality the system for interpreting the Enneagram has always been that of direct transmission: “word of mouth”. Via certain sources of information, also based on the Islamic culture, it is possible to discover the wide range of symbology related to the Enneagram. Let’s start with the concept that every person has his/her own personality, which is the result of both a series of social influences and his/her own processes. The personality is, however, in sharp contrast with the part known as “Essence”. “Essence” is the sole target of sacred psychology in general. Its intention is to bring “Essence” back into a balanced and flourishing state. It is reported that among the Indian Sufis in 1709 Shamsudin Habib Allah, a boy of nine years old had a vision of the Patriarch Prophet Abraham who passed his spiritual powers on to him. Gurdjieff relates in his book, Meetings with Remarkable Men that while in Afghanistan, around 1897, a dervish introduced him to an old man of the Sarmouni sect he had been searching for. As the story goes, this man arranged for an expedition to take Gurdjieff to the Sarmouni monastery in central Turkestan, where he learned their mystical dancing, psychic powers, and the enneagram. For the Sarmounis the enneagram was important as a means of divination to foretell future events as well as a tool to represent life processes, such as personal transformation.They also used it as a symbol of the conscious and unconscious states in human beings. Later Gurdjieff went to Bokhara, where the Bahaudin Naqshbandi band of Sufis lived.